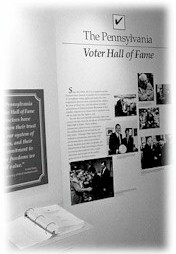 Administered by the Department of State's Elections Bureau, the Voter Hall of Fame was established to acknowledge and honor Pennsylvanians who have voted in every November election for at least 50 consecutive years. Pennsylvania Voter Hall of Fame applications for membership may be obtained by calling your county voter registration office. If you are interested in obtaining a Pennsylvania Voter Hall of Fame application, please contact your county elections office or download the application here.